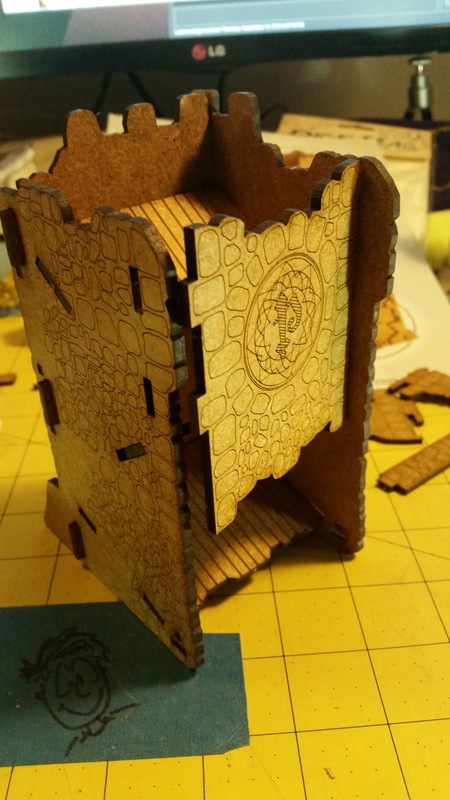 d4d6d8d10d12d20: How To Build The Q-workshop / Pathfinder Dice Tower!!! 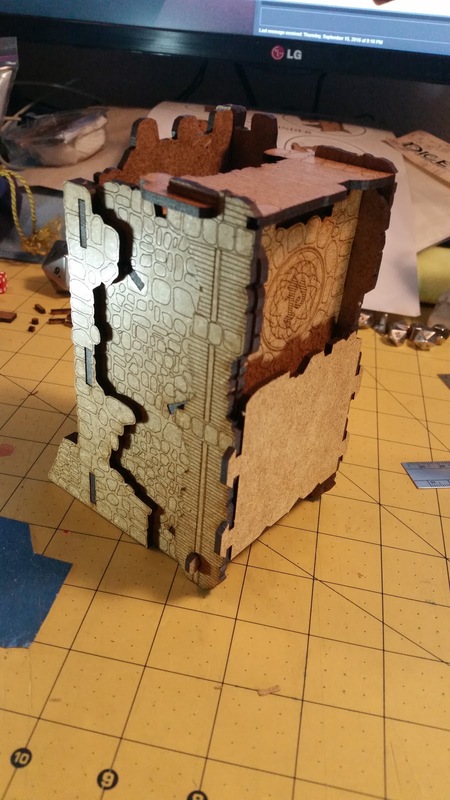 How To Build The Q-workshop / Pathfinder Dice Tower!!! 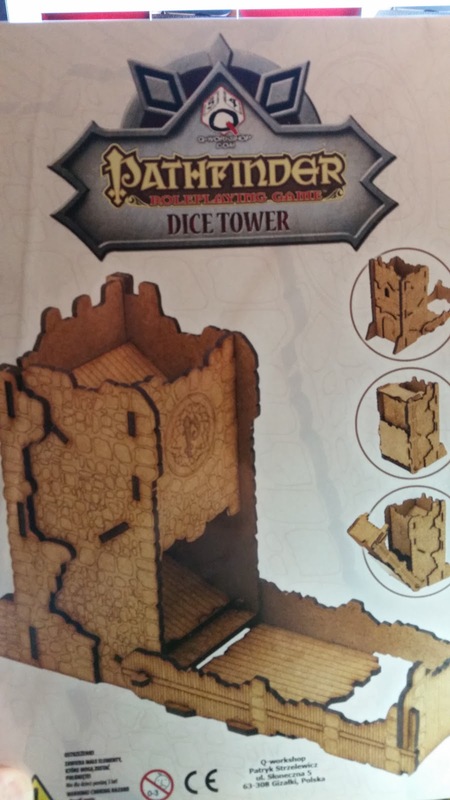 Way back in October 2015, I backed a Q-workshop / Pathfinder Kickstarter for a set of metal polyhedral dice, because as many of my friends/family/readers know, I'm absolutely mad when it comes to dice! I love almost all types of dice, well all dice except for those damn wooden dice, but that is another blog post entirely. 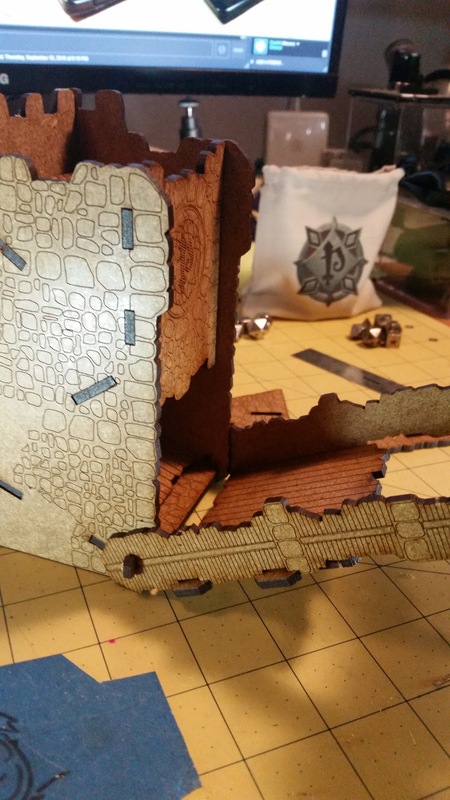 I chose the $69.00 level of rewards, which included a set of "lead free" metal polyhedral dice, the review of the dice set is coming soon, and any stretch goals unlocked. The "free" goals unlocked were a set of green "Goblin" polyhedral dice, a linen bag, and a laser cut dice tower! 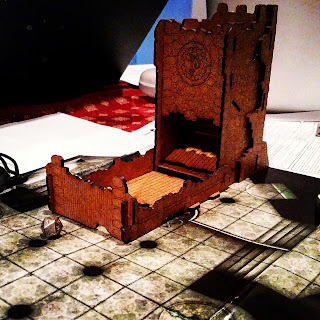 A dice tower is used when rolling dice to help "randomize" the dice results during a game, e.g., The Pathfinder Roleplaying Game, Dungeons And Dragons, but it really can be used for any game with dice. 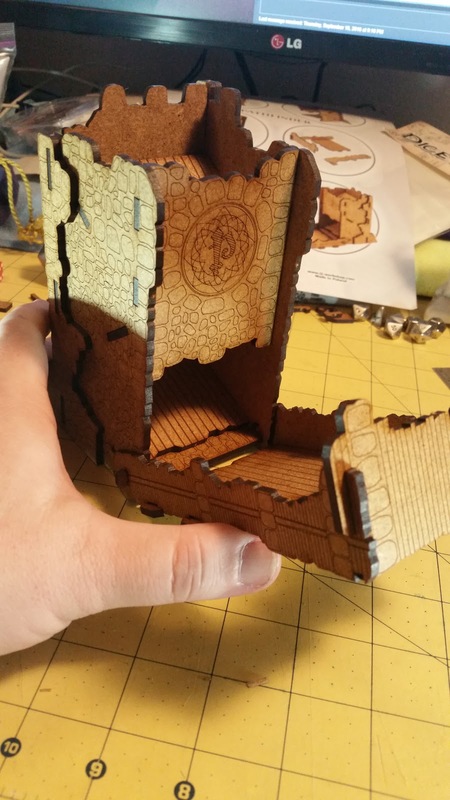 First off a WARNING: This is a laser cut wooden item. 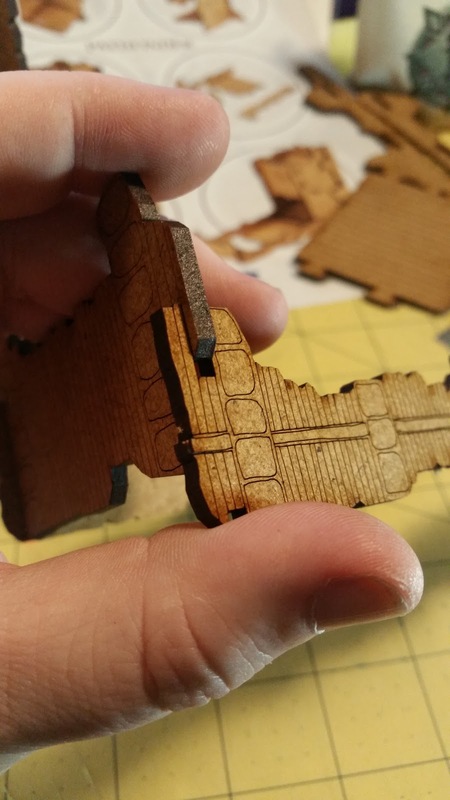 If you never had a laser cut wood piece before, IT SMELLS OF BURNED WOOD, almost like a smoldering campfire. 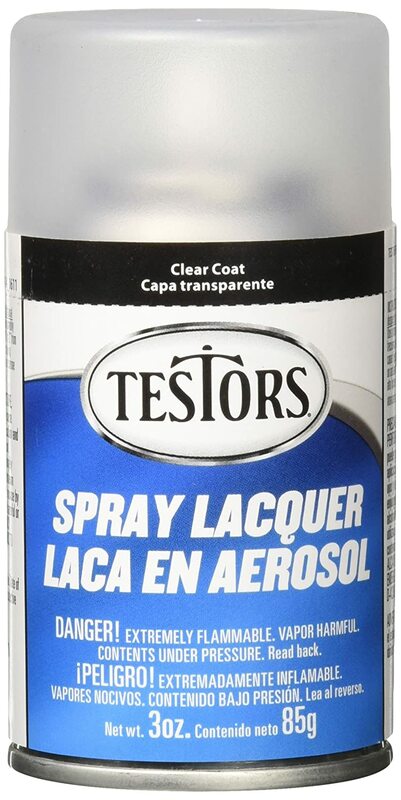 Its a strong odor and will remain with the item, unless taken care of, more on this below. 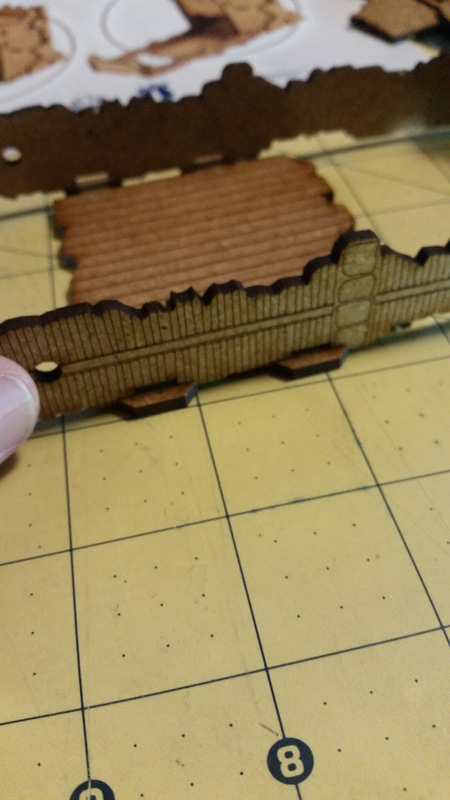 In addition after touching the laser cut wood your fingers will also smell of burnt wood for a while. I, Myself, enjoy this odor. The smell reminds me of all the times camping with family/friends. Glue, If you wish to affix things permanently but isn't needed. Wood glue recommended. 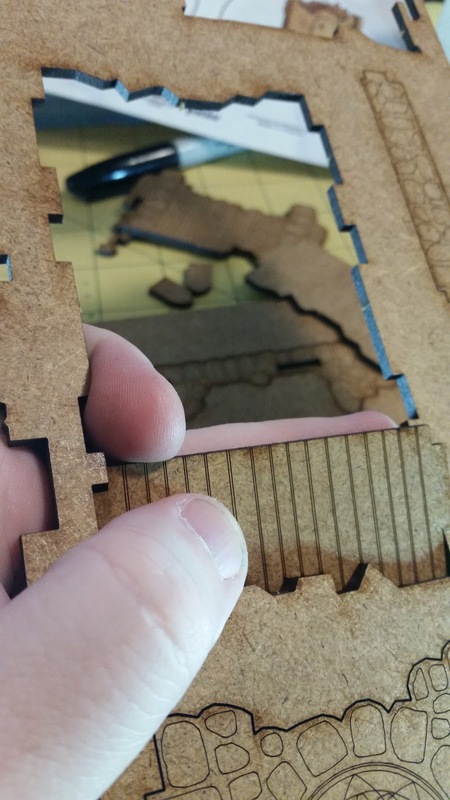 Pair of tweezers, to help with placement of the small bits. 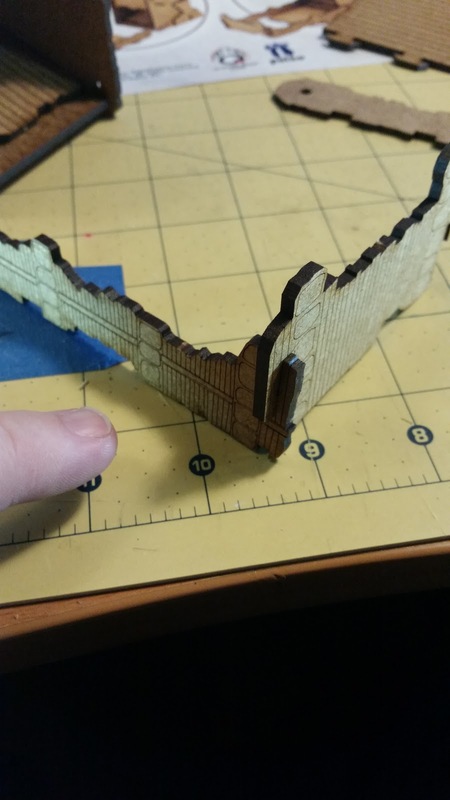 Modeling tool, Sharpie Pen, or similar "pointy tool", for pressing small bits out of the wood. Masking Tape, recommend the blue painters tape. Hobby Knife, or Utility Knife, for cutting out stubborn parts. 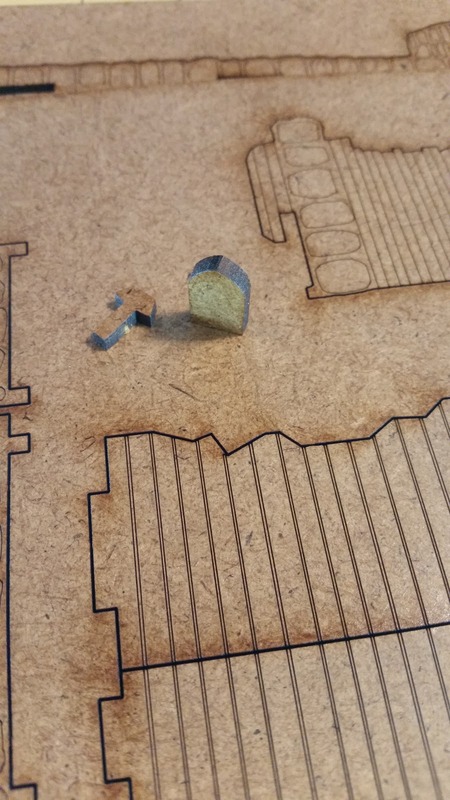 A few of the parts might have fallen out of the laser cut wood, don't loose them! 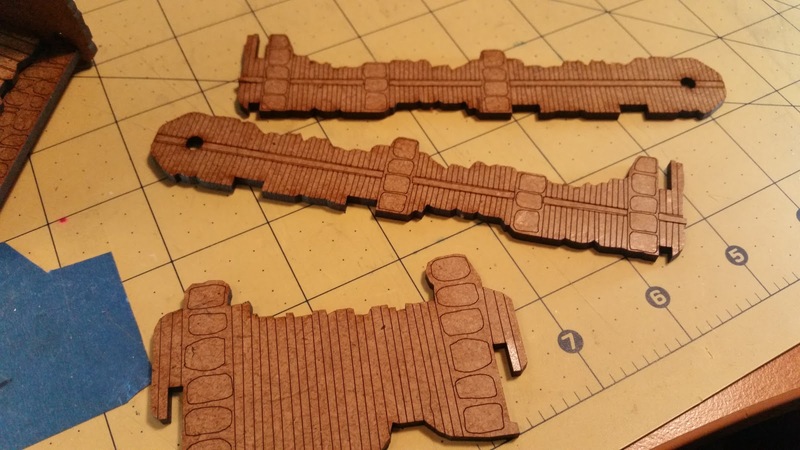 The ones shaped like hammers are used for the "drawbridge" mechanism. 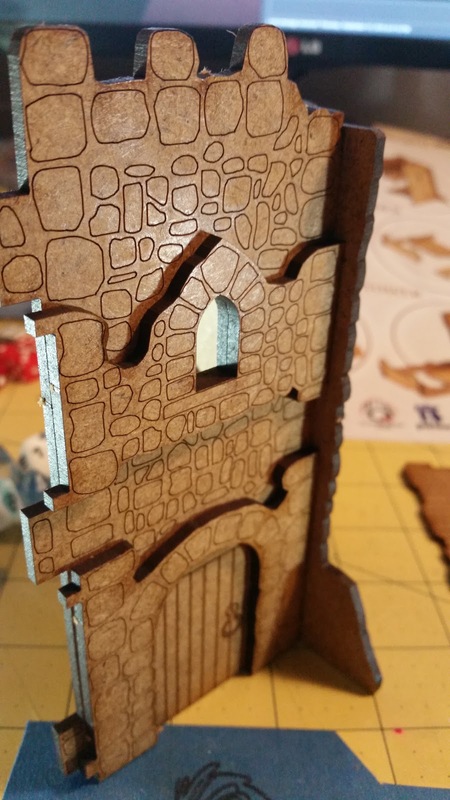 The archway can be either tossed or used as a game marker! 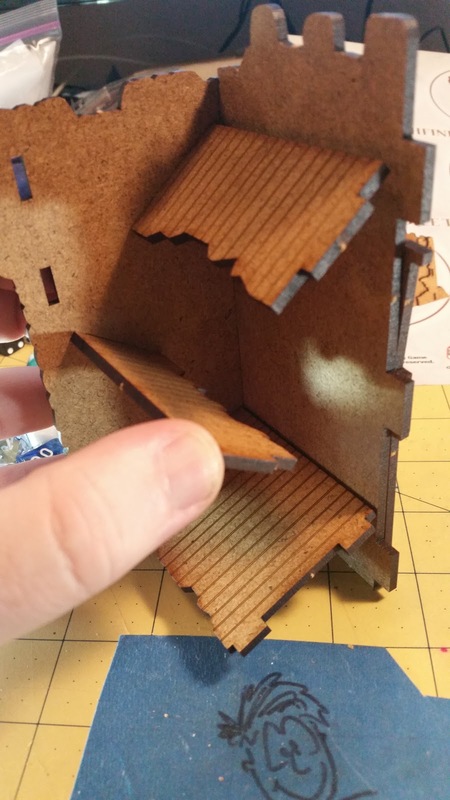 Pop out the remaining pieces with the modeling tool, sharpie pen, or your fingers, and arrange them so you can see each piece. 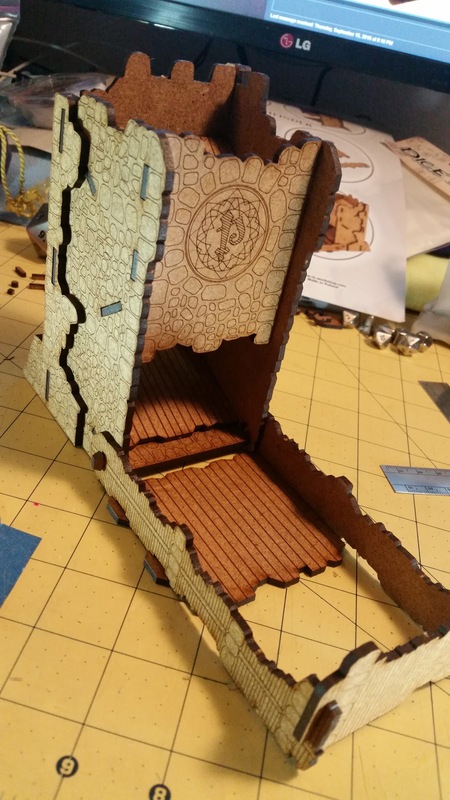 Grab the back piece, It is one of the larger pieces with the "door" engraved upon it, and then one of the side pieces notice that the "feet" of the side piece face the rear, so it should be fairly easy to tell which side faces which. Insert the back into the side piece the little square/rectangle holes should be fairly snug with fitting the little tabs on the back into. Just be careful and try not to snap off the little tabs. If the square/rectangle holes are hard to get out use the tip of the sharpie pen to push them out, if really difficult use the hobby knife or utility knife and run the blade around the cut to free up the spaces. At this point find the other "decorative" pieces as can be seen below that fit over the back piece for the window and the door to create a 3d-ish effect. These pieces will help stiffen up the "frame" a bit later as the panels can't slide around. 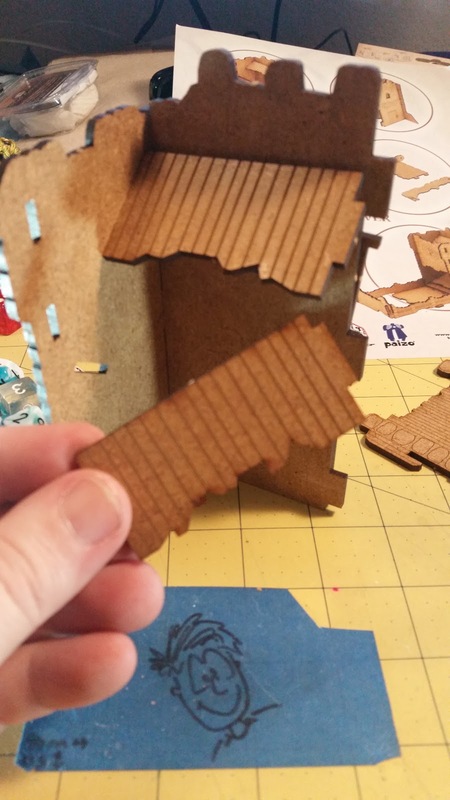 You could at this point place a drop of glue at each juncture with a brush or just your glue bottle, taking care of wiping away any excess glue. I skipped this step being that all my pieces were really a snug fit, though with continued use I may go back and add glue at a later date. 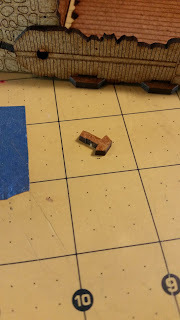 Now find the "floor" pieces for the "tower" there should be three that look similar, and one that has cobble stone on it instead of planking. 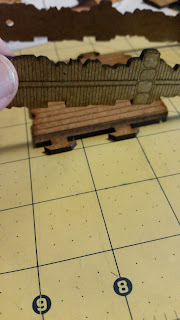 The ones with planks there should be a small, medium, and large. 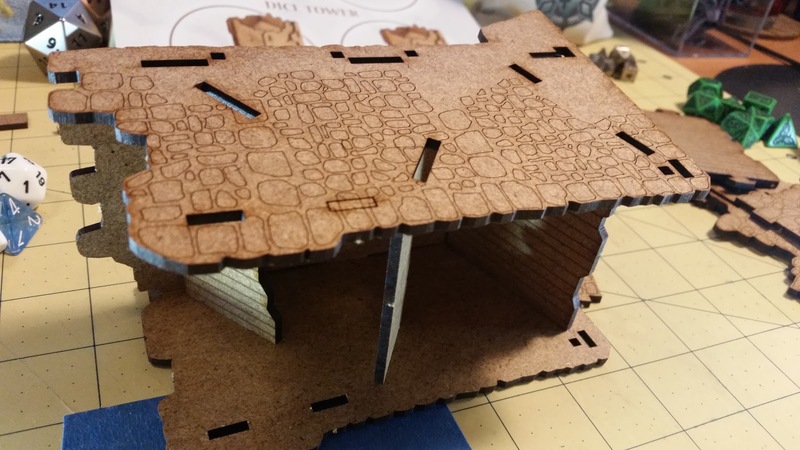 If you look at the pictures provided on the sheet it appears that the medium is attached as the top slide, the small is the second slide, which leaves the larger as the last slide followed at the bottom with the cobblestone small floor. 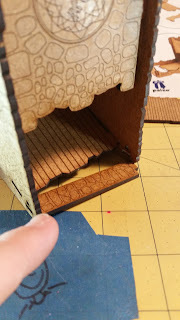 You could use painters tape here to secure the floors in place while you either place glue at the junctions or to just hold them in place before the next step. Here you can just flip the entire piece on the side to keep the items you've already placed intact then grab the other side piece and align the tabs and secure the side tightly together. Then you can grab the front of the tower the piece marked with a P in the center, and slightly pry apart the two sides to where you can slide in the front part of the tower as well as the little cobble stone foot. 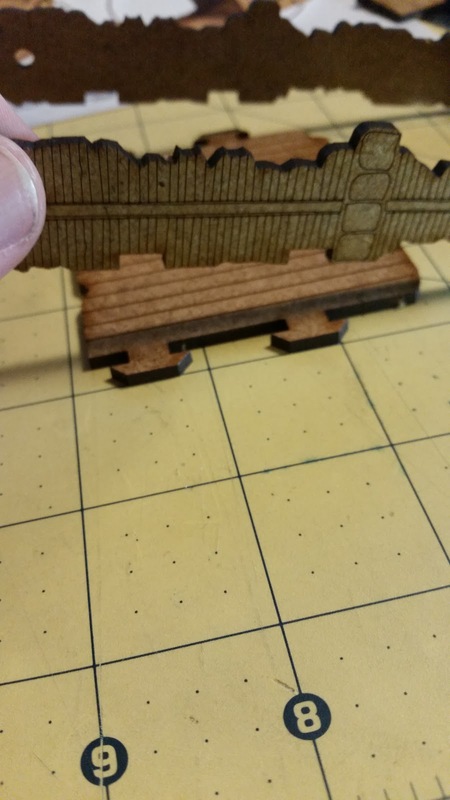 Note the small foot only goes one way, it should slip under the large plank floor. 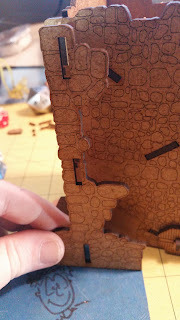 Now you can place glue in the junctions if needed. Now to construct the "fence" to keep the dice within the dice tower proper. Grab the two side pieces along with the front of the "fenced in area". You can see the pieces below. Slide the front piece down into the grooves of the sides of the fenced in area. Finally grab the "bottom" of the fenced in area and slip the sides into the grooves near where the fenced in area connects to the tower. 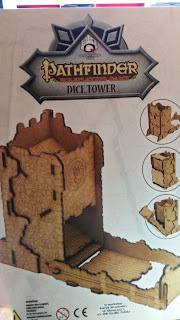 Yes there is an open area near the front of the fenced in area, this is either for easy dice collection, or they just want to show off the logo when the tower is in transit. Now grab those little bits I said not to throw away at the beginning. Amongst them should be a few that look like little hammers. These are your connectors, to secure the fenced area to the tower. I had eight of them if I recall. 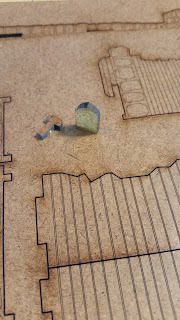 So essentially you slide over the fenced in area and line up the holes and then insert these little hammers securing the fence area with the tower, which then can subsequently be "raised and lowered" for transport. The hammers are square in nature as is the holes in the tower so they do fit snugly, and the fenced holes are larger and more round to allow for pivoting of the fenced area to fold up for storage/transit. 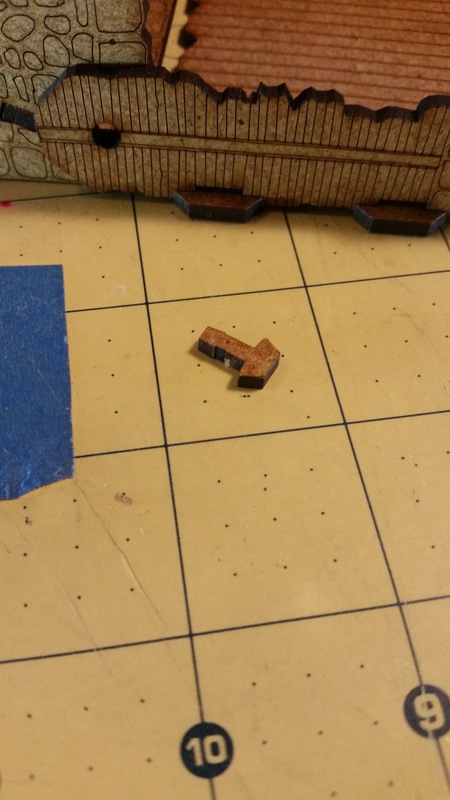 This is one area where I might actually "upgrade" to either a rivet, or maybe a metal brad to allow for better security, as this was the weak point during our first game with the dice tower, where were using metal dice from various manufacturers, and the fence pegs would pop out time to time, which then needed to be placed back in. 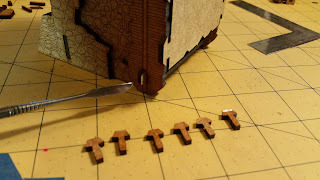 The final step is to find the remainder two "decorative" pieces and place them accordingly, which should be over the tabs on the back side of the dice tower. These should snap on and secure up the whole tower now allowing any of the sides to jostle back and forth. 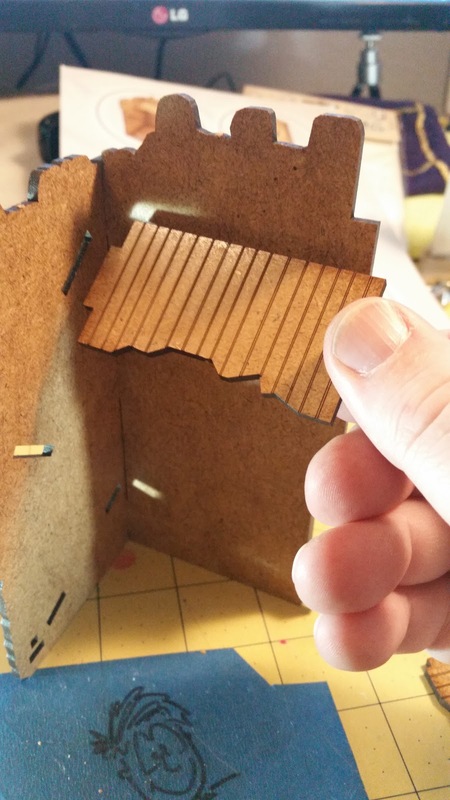 Again use of glue here might go a long way in making this structure permanent. Again I just had all my junctions dry fitted, and a few of my friends were whipping their 16mm and 14mm metal polyhedrons into the top maw from across the table and the tower didn't once "pop" apart, except for two connectors which joined the fenced area and the tower, but liked I mentioned above either rivets or metal brads would do the trick to fix that issue. 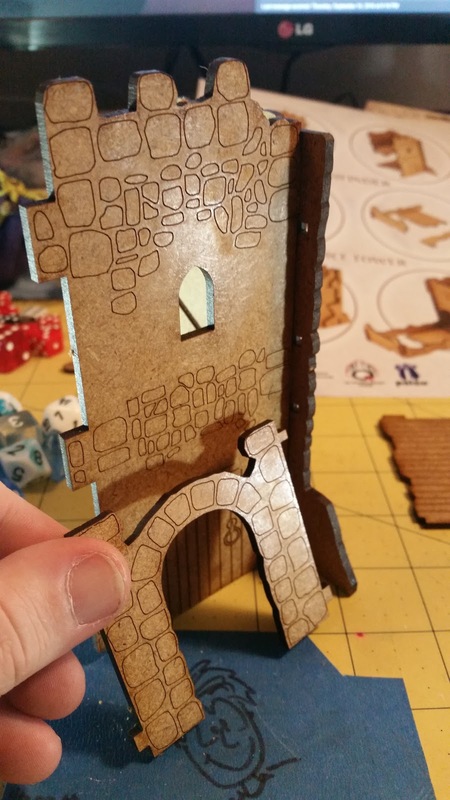 Here is the "drawbridge" mechanism in action! This is what it looks like in storage/transit mode! 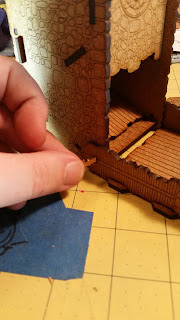 Step 8 (optional): To finish off the dice tower, and perhaps remove some of the smell, or maybe the ease of the transfer of the smell to your fingers, you could hit it with some spray sealer. 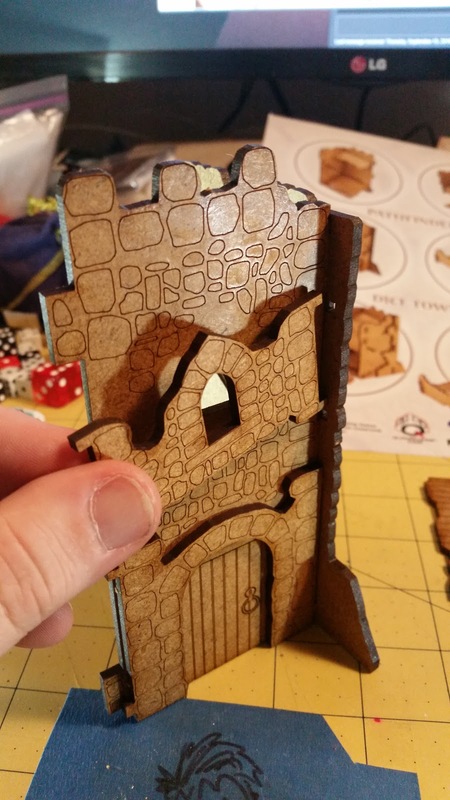 You would want to separate the fence area from the tower, so you don't end up sticking the two pieces together. I personally would apply a coat BEFORE construction, as the thin layer of varnish might cause the connection points to become slightly larger and will then need to be slightly sanded. 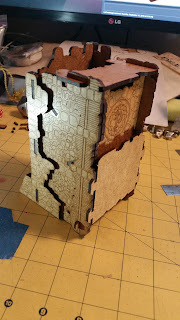 Also only work in very light coats, flooding the pieces with spray will likely warp them. You can also follow me on the various social media sites, where I typically post tidbits, previews, and other items that might not encompass a full blog post or full length video. I also sometimes put up info on upcoming activities, live streaming events, Q & A's, or just the day to day musings! Thanks for stopping by!